Posted on Thu, Feb 9, 2012 : 6:04 p.m.
Crews respond to a hazardous materials investigation at the Circle K gas station near Stadium and Packard Thursday evening. Crews from the Washtenaw County Hazardous Materials Response Team are at the Circle K gas station at the intersection of Stadium Boulevard and Packard Road and have closed down the area. Ann Arbor Fire Department and Ann Arbor Police Department officials were unable to comment immediately Thursday afternoon on what caused the need for the crews at the gas station. Personnel at the scene Thursday evening were unable to give information. 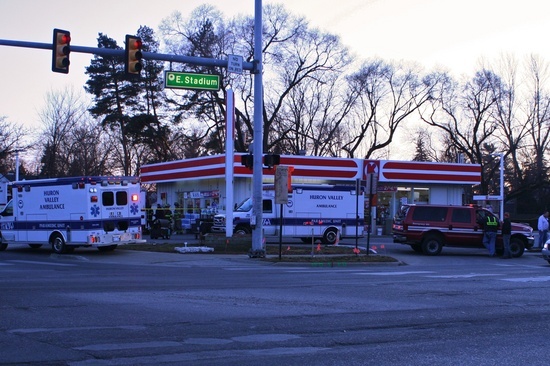 Two Huron Valley Ambulance crews, four Washtenaw County HazMat teams and an Ann Arbor Fire Department HazMat crew were responding to the gas station just after 6 p.m. Thursday. Washtenaw County Sheriff's Office spokesman Derrick Jackson said he spoke with Marc Breckenridge, county director of emergency management, about the incident. The situation did not appear to be too serious and it was likely that some suspicious residue had been found, Jackson said. The county's hazmat crews left the area just before 7 p.m. Thursday, with just one vehicle each from the Ann Arbor police and fire departments left behind. Officials from the Ann Arbor Fire Department were unable to be reached Thursday evening to get more details. Check back to AnnArbor.com as we find out more about this incident. Crime reporter Kyle Feldscher contributed to this story. Sat, Feb 11, 2012 : 12:19 a.m.
Glad to know that the Citgo gas station across Packard was unaffected by Circle K's situation, other than perhaps some lost business while the whole area was shut off from traffic. Glad to see all the English Majors out there have found a hobby. If it wasn't for all of you there wouldn't hardly be any comments on some of the stories. I sometimes feel like I'm back in school with the nuns hovering over us. Fri, Feb 10, 2012 : 1:36 p.m.
@Joe: Thanks for dredging up memories of the hovering nuns for me. Good analogy, and a laugh this morning, too! Fri, Feb 10, 2012 : 4:01 a.m.
No doubt someone spilled a quart of oil. Call out the national guard! Fri, Feb 10, 2012 : 3:44 a.m.
Fri, Feb 10, 2012 : 3:03 a.m.
Danielle Arndt wrote: &quot;Washtenaw County Sheriff's Office spokesman Derrick Jackson said he had spoke with Marc Breckenridge, county director . . .&quot; Danielle, there is enough sub-standard use of the English language in this country as it is. Let's at least not put it into print - some people believe everything they read is right and the truth. The various media are in a position to raise the educational level of the masses - or lower it. The responsible path should be obvious. Thanks! Fri, Feb 10, 2012 : 3:47 a.m.
Fri, Feb 10, 2012 : 2:33 a.m.
Maybe it's a gas leak - they had those new pumps installed last fall and it took them a very long time. Maybe the job wasn't done correctly. Fri, Feb 10, 2012 : 3:49 a.m. I was down there when the Hazmat crew/ambulances were there and some other police units were arriving. Someone talked to an officer who said it was related to employees at the station getting ill, possibly from something on the money. Not exactly an official response or anything, but nothing was mentioned about a gas leak when I was there. An email from the City of Ann Arbor posts this message at 5:26 p.m. from AATA (no mention of the Circle K situation): This is a message from the Ann Arbor Transportation Authority AATA SERVICE DISRUPTION INFO: DOWNTOWN ANN ARBOR A gas leak near Division St &amp; Liberty St in downtown Ann Arbor has closed those streets in that area. As a result, all routes that run in the downtown Ann Arbor area may experience significant delays until traffic patterns return to normal. The latest information on TheRide routes, schedules and detours is available at 734.996.0400 and on the Routes and Schedules page. Fri, Feb 10, 2012 : 1:25 a.m.
&quot;had/has spoke&quot;. Seems like in the mid-west at least, the demise of the past participle is in full swing and being replace on a regular basis by the simple past form with the (past)perfect tense auxiliary. I base this observation on listening to many speakers in the region day in and day out. It's quite annoying, but it seems to be the direction in which the language is evolving. Fri, Feb 10, 2012 : 1:17 a.m. I hope everyone is ok. However, is it inappropriate to ask if Polar Pops are operational? Fri, Feb 10, 2012 : 1:10 a.m.
Police, fire department and ambulance responders were present at the Circle K prior to 4 pm. I am not sure why it is being reported that they responded after 6 pm. Fri, Feb 10, 2012 : 1 a.m. He had spoke, huh? He said that or A2.com did? PLEASE clean up the grammar on this site! Impressionable children may be reading it. Fri, Feb 10, 2012 : 12:14 a.m. I was in that area on foot from 5:15 to around 5:45, the area was already cordoned off to traffic (which caused jams on State and Main. A mostly-red colored copter was hovering for about 15 min. over Fifth Ave. &amp; William St. It was obviously an emergency response operation but no one on the street seemed to know the nature of the emergency. I see there was an almost simultaneous emergency response at Packard and Stadium. Glad no one was hurt (apparently) in either case. Also - it's good to see that Ann Arbor can handle operations on that scale. Fri, Feb 10, 2012 : 12:16 a.m.
Thu, Feb 9, 2012 : 11:59 p.m. Okay, then what was going on downtown during the same period?? I was near William &amp; Main @ around 6:10 PM and saw an AAPD patrol car come westbound and turn North on Main w/ lights &amp; sirens when that stretch of Main is wall-to-wall. Right after that, I saw what might have been a police car blocking Division north of William. Soon after, I spotted a TV news copter (mostly red in color) coming from the East. It hovered for about 15 minutes @ 300 feet quite near the intersection of 5th Ave. &amp; William St. From the orientation of the copter, it appeared to be viewing the area covering the new underground parking structure and the surrounding area. There was no smoke visible anywhere, so whatever the event, it probably wasn't a fire. But others told me of seeing AAFD vehicles on Division North of William. Fri, Feb 10, 2012 : 12:11 a.m.